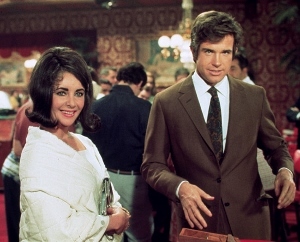 The 1970 melodrama The Only Game in Town is noteworthy for the mismatching of Warren Beatty and Elizabeth Taylor as a down-on-their-luck, Las Vegas couple. There is simply no chemistry between the two stars, then both in their 30s. Originally a Broadway play of the same name, the material doesn’t successfully cross over to the screen. Frank D. Gilroy’s dialogue (of which there is a LOT) remains quite incisive most of the time. The problem is that Beatty and Taylor are playing such unsavory characters (Beatty in particular) that it’s difficult to connect with them. This was Oscar winner George Stevens’ final film. Fran (Taylor) is a showgirl nearing the end of her usefulness as a dancer. She’s single, waiting patiently for a married man with who she’s had an affair to ditch his wife and kids for her. She knows it may never happen. Joe (Beatty) is a piano player who loathes Vegas and wants nothing more than to get out. His gambling problem makes it difficult to save the $5,000 he figures he needs for six months’ seed money in New York City. They meet one night and wind up in Fran’s bed, where they find they are compatible (sexually, if in no other way). A relationship takes root, despite Fran carrying a torch for her California-based dream lover. Taylor and Beatty inhabit their roles very well, with Beatty especially turning in magnetic work. It’s hard to fathom, however, why these two really want to be with each other. Fran tries to hide Joe’s money for him in an attempt to keep him away from the casinos. Joe will stop at nothing to find it, going so far as to destroy one of Fran’s prized collectible mugs that she keeps as family heirlooms. For me, this unapologetic action represented the crossing of a line. Though Joe is not physically or even verbally abusive towards Fran, this simple, cold-hearted tactic to get what he wanted is such a scumbag move, I couldn’t pull for him (or Fran, who continues to stay with him). 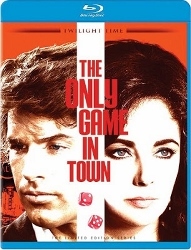 Twilight Time has issued The Only Game in Town on Blu-ray and its high definition debut is a very visually disappointing experience. The source print was far from clean, with lots of little dirt specs flicking across the screen. Sharpness is inconsistent, though this seems to be largely inherent in the original cinematography. Taylor’s close-ups are soft-focus to the point where they sometimes look like they were filmed off a TV screen. One profile shot of Beatty and Taylor together is so soft, it produces a weird double-image effect. Again, these issues don’t seem to be the fault of the transfer (I’ve never seen the film in any other form). The DTS-HD 1.0 mono track is fine for what’s required. The Maurice Jarre score is offered as an isolated track in DTS-HD MA 2.0 stereo (the only special feature, along with the theatrical trailer). The Only Game in Town will likely appeal to Beatty and Taylor completists primarily. Twilight Time’s Blu-ray is available as a limited edition (3,000 copies pressed) and can be ordered exclusively via Screen Archives.